In Wildlife Management Services we pride ourselves in providing a professional service. 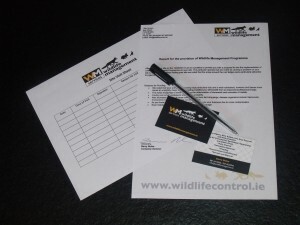 If you have a Wildlife Problem we will be happy to visit your site and provide you with a free no-obligation survey. Each species and environment will have slightly different workings and it is important that we take the time to examine how best to solve your wildlife problem. Furthermore depending on species there can be restrictions in place regarding their management due to Wildlife Legislation, we can make you aware of these restrictions and inform you of the best times and methods to deal with your problem. Also, we can aid you in liaising with the National Parks and Wildlife Service in applying for any exemptions or permits which may be required. We understand the importance of Health and Safety standards in specific industries and have worked with companies in the past to ensure that the correct steps are taken to reduce the risks associated with problem species. In Wildlife Management Services we can provide you with a report to assist you to identify the risks present on your site and how to minimise the hazards related to them. Once our Wildlife Management Programme is in place on your site we can provide you with reports or a post-visit summary in order for you to see how the programme is progressing. Due to the nature of our work it is oftentimes difficult to completely remove a species so it is important that you are aware that the species are being controlled in order for it not to reach infestation levels again. We provide both once-off solutions or we can implement on-going Wildlife Management Programmes which is often recommended in order to maintain a presence on site in order to make the site hostile to problem species.